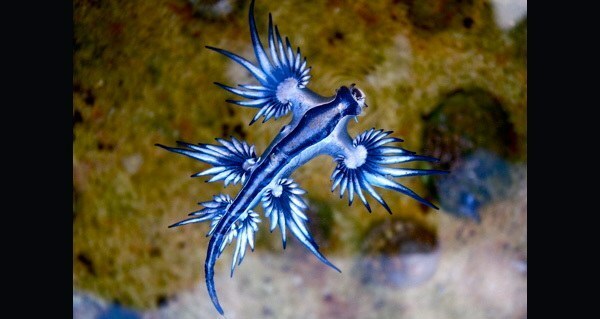 Glaucus atlanticus, or the blue dragon, is one of the most fascinating looking creatures in the ocean. And also one of the most deadly. 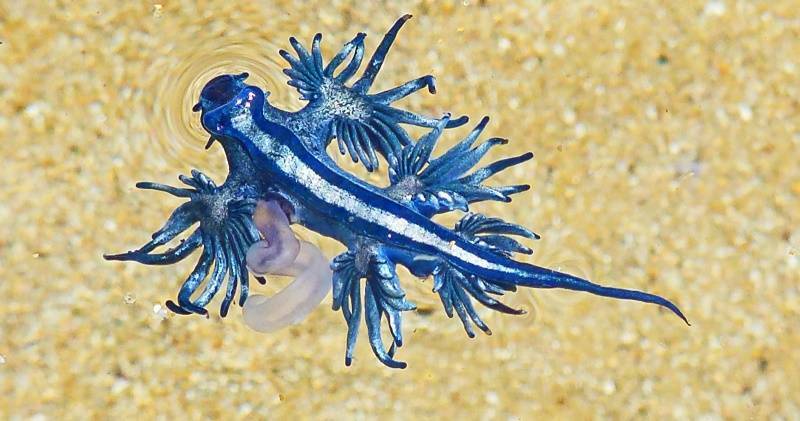 Recently, miniature blue dragons washed up on Australia’s shores. The dragons drew in beachgoers, as they always do, with their strange, singular beauty. But no matter how beautiful or small these creatures are, if you ever see one, you should back far away. These dragons, also known as blue angels and sea swallows, are technically called Glaucus atlanticus and are simply sea slugs that top out at around an inch long. But what they lack in size, they make up for in ferocity and beauty. Glaucus atlanticus isn’t the bottom-feeding sea slug people are used to seeing. They use a gas sac in their stomachs to float upside-down in warm ocean currents, snagging other small poisonous jellyfish with their tiny blue feet. When the slug comes across a helpless jellyfish drifting unwittingly to its death, it snatches it by its body and pulls chunks off of its gelatinous mass with strong jaws and rows of needle-sharp teeth. And if there aren’t any venomous jellies around to ingest, blue dragons will turn to cannibalism. FlickrA photo of the Glaucus Atlanticus. Glaucus atlanticus can be just as dangerous on the beach. After they’ve fed on poisonous jellyfish, they have the ability to concentrate that poison within their bodies and unleash a sting more powerful than that of the jellyfish they ate. Unsuspecting beachgoers can sometimes find themselves on the painful end of that sting. Glaucus atlanticus sightings are rare, but far from unheard of, on the shores of Australia. This isn’t surprising given the creature’s preference for the warmer waters of the Pacific and Indian oceans. But just last month, a small wave of blue dragons hit the beaches of Florida — beautiful as they are, let’s hope this isn’t the start of an invasion. After learning about the surprisingly deadly Glaucus atlanticus known as the blue dragon, check out some of the most bizarre ocean creatures. Then, discover the most bizarre facts about jellyfish and learn about the “baby dragons” that just hatched in Slovenia.